Every once in awhile I inventory my closets to see what needs to be retired and what needs to be added. I noticed that I only have only red dress in rotation. That was kind of odd, since red is one of my favorite colors. So I decided it was time to add a little warmth to my wardrobe. This is the perfect time. The holiday season is around the corner, and I may as well get a head start. So I began with a simple princess seam red dress. 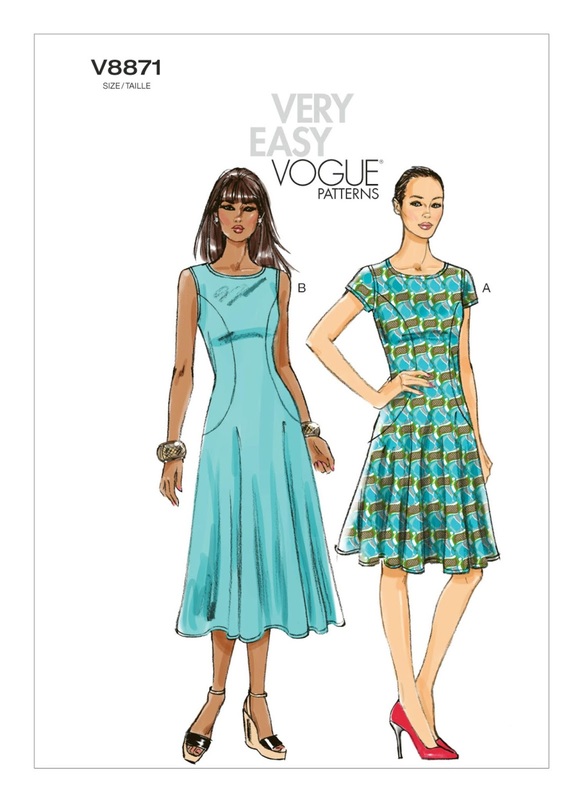 Vogue 8871 is perfect: it’s simple; it’s fit and flare; and it’s cute. Mood’s red stretch rayon-nylon ponte knit is a perfect match for this dress. 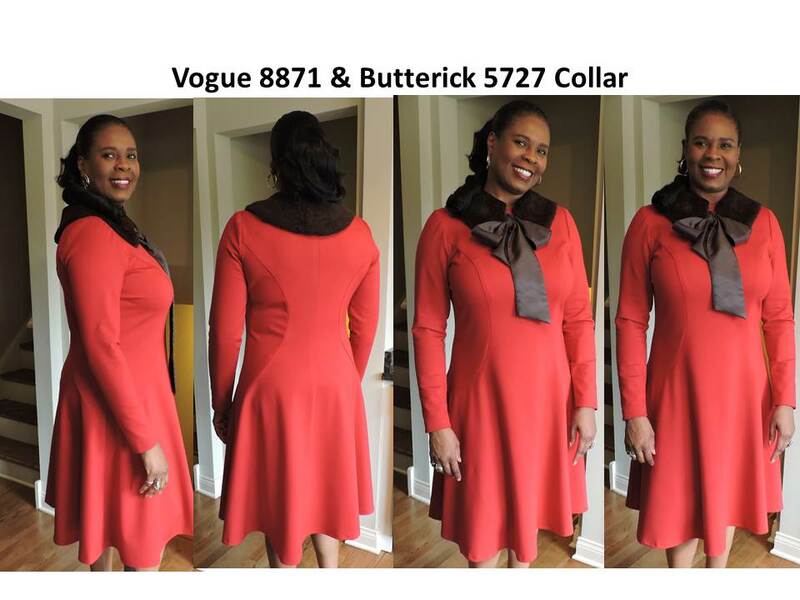 Initially, I made view B adding the sleeve from Vogue 1314. I tried it on several times before and after hemming it. Something wasn’t right. So I call in my little consultant, my darling daughter. Immediately, she said, “It’s too long. Take a few inches off.” Still I was trying to make the length work, trying on various belts. I didn’t want to cut it off after all that hemming. Tee hee. So finally I gave in, cutting about 3.5 inches off the dress. Now, I’m happy. Sway back adjustment by adding a center back seam, folding out the access at the waist and curving the center back seam to fit. I don’t like to do a narrow hem at the neckline. So I made a neck band about two inches wide and two inches less than the length of the neckline. I didn’t top stitch around the armhole, nor did I double stitch the seams. I stitched once and finished the edges with the serger. In the end, the dress did look like view A with long sleeves. I barely looked at the instructions, as this is a very easy dress to make. The instructions were less than a page after the layout information. My only dislike was the narrow hem for the neckline. I like a narrow neck band that is attached then turned in for a clean sturdy finish. 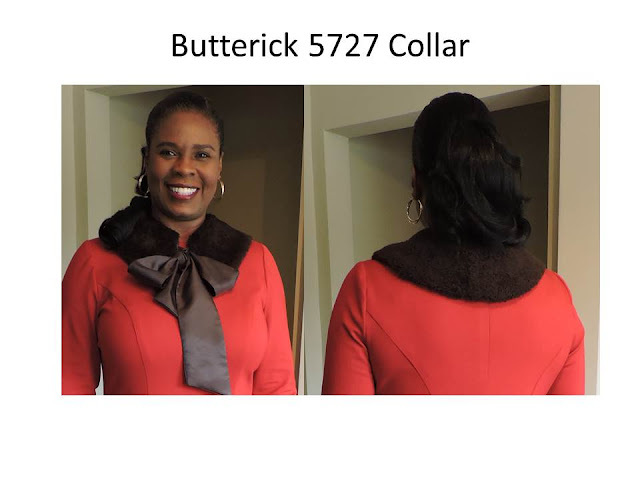 This is a very easy pattern that beginners can sew, and it is flattering on most body shapes. It’s worth a try. Medium Brown Lamb Shearling, Chocolate/Black Iridescent Twill Lining, and Butterick 5727. So sorry the medium brown lamb shearling is sold out. I was able to grab two pieces around this time last year. Way back then, I did not know what I’d do with it. When I saw it, I wanted it; so I got it. The good news is, Mood has other shearlings that may interest you. As for the Chocolate/Black Iridescent Twill Lining, they have it in stock and it is perfect with the lamb shearling fur collar. You can easily make it without a pattern, but I had it on hand. So why not use it. 😉 I made size medium. The only change made: I double the ties. It looks much nicer then the narrow hem method. So you never see the wrong side of the fabric.